Tyrone McKenna is ready to ride a wave of fanatical home support to victory over world-ranked Jack Catterall in Belfast on Saturday. McKenna (16-0-1-KO6) and WBO Inter-Continental Jr. Welterweight Champion Catterall (21-0-KO12) put their unbeaten records on the line at The SSE Arena on the undercard of Michael Conlan v Adeilson Dos Santos and although an underdog, McKenna is brimming with confidence. ‘The Mighty Celt’ said: “He said I wasn’t his toughest test and he can believe what he wants to believe. He’ll be unpleasantly surprised. “I know it’s a tough fight for me but I don’t think he knows how tough it’s going to be for him. We’ll see on the night. “Taking me at four weeks’ notice isn’t a smart move by him. He’s not faced a tall southpaw like me. I’m not a standard fight. “I’m well supported in Belfast and it’ll be electric on the night. All Michael Conlan’s fans are my fans too because I’m good friends with him. Everyone will be behind me and it’s going to be very, very loud. 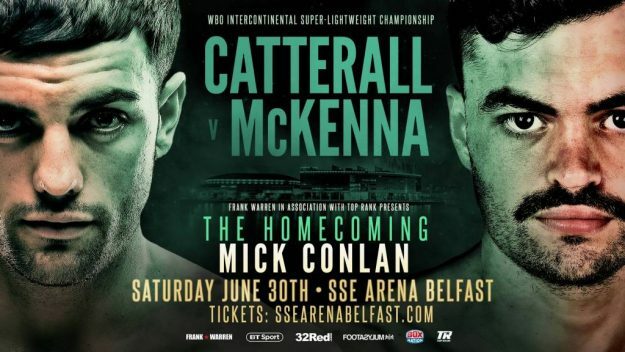 Catterall v McKenna features on a huge undercard that also includes Jono Carroll v Declan Geraghty, Johnny Coyle v Lewis Benson, Tyrone McCullagh v Joe Ham and more.